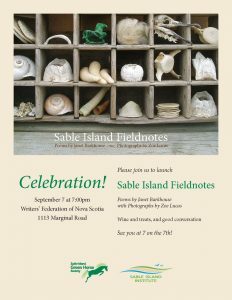 The launch of Sable Island Fieldnotes, a chapbook of poems by Janet Barkhouse and photographs by Zoe Lucas, at the Writers’ Federation of Nova Scotia was a delightful occasion. More than forty wonderful people came through wind and rain to celebrate with us. The chapbooks are available now by contacting me and, eventually, by going to the new (and beautiful) Sable Island Institute Website. The chapbooks are $15.00 Cdn, plus shipping. Every cent goes to fund research on Sable Island, through the Green Horse Society and the new Sable Island Institute.